Nose Work odors are Essential Oils. The National Association of Canine Nose Work (NACSW) uses Birch oil, Anise oil, and Clove oil. Some Canadian organizations use Wintergreen oil. The American Kennel Club (AKC) uses the NACSW odors plus Cypress oil. Other organizations use other oils, including lemongrass oil, myrrh, and vetiver. Check with the Rule Book for the organization you plan to compete with, to be sure you are training on the appropriate odors. Whichever oils you use, it's important to know all about preparing and storing Nose Work odors. In summary, it pays to be extremely careful with your Nose Work oils, for the sake of your dog's scent training. The AKC prepares odor differently than other organizations. If you intend to compete with the AKC in scent work, you should practice using swabs prepared their way. That way, your dog will be familiar with the AKC strength of odor used at their Trials. Find out more on their website. While preparation is different, AKC oils should be handled and stored the same as any other Nose Work oil. As mentioned above, you don't want to touch your Nose Work oils. Treat the oils as if they are non-toxic florescent permanent paint. Or, think of the oils as being highly contagious germs, that spread by physical contact (not airborne), or like caustic acid. If you touch the oil, it will get on everything else you touch. That means anything you touch will be a source of odor; your dog should get rewarded for finding it, but you won't be able to see it, to know that it's there. If you get the oils on your finger(s), wash your hands thoroughly as soon as you can, and try not to touch anything along the way. To handle your Nose Work oil swabs, use tweezers, hemostats, or latex gloves. Use dedicated tweezers or hemostats (they can be cheap versions), to avoid spreading the oils. Dispose of your used gloves carefully and immediately, before they contaminate other surfaces. Note: These are all virgin (non-oiled) swabs and tins. Even for a picture, I would not do this for real. The result of being careless with handling your odor? You'll confuse and frustrate your dog. You'll dilute your dog's drive to find Nose Work odors. Be a good Nose Work Citizen. Never just hide a naked odor swab; always make sure it's inside a tin or another kind of container (see the previous point about permanent paint). Never "paint" objects with Nose Work oils. I've recently heard of people who will put Nose Work oils directly on leaves and twigs, and leave them in public areas -- bad idea! And, so rude! Imagine that your dog visits the area next -- you'll have no idea that you should be rewarding your dog, instead of pulling him off of odor. If your dog ate the scent leaf or twig, would you even know? If another dog took it and left with it, how would you know? Never leave a hide behind, particularly in a public place where other Nose Work dogs and their handlers may become very confused. Count all of your hides before and after your practice to make sure they're all present and accounted for. Take pictures, and/or make notes, as you place the hides, in the event that your dog cannot find all of them. It's much easier to forget where you placed a hide, than you would think. Be very careful about placing hides in public places, leaving to let them age, and coming back later. Do not leave hides to age, in public places, unless you have confidence that no one else will be doing Nose Work there. Other dogs may want to find your hides but be reprimanded, which is so bad for their training. If another Nose Work enthusiast finds your hides, they may pick them up and take them home, leaving nothing for your dog to find but residual odor. For storage, we like to contain the odor, so that our dogs can only smell it while they're doing Nose Work. That way, we increase the value of the odor. If they can smell the odors all the time, they lose importance to the dog. Also we don't want Nose Work odor molecules spreading out over everything including the places your dog might end up searching. So, keep all odor-related items in an air-tight box. Or alternatively, keep all of your odor supplies in at airtight Mason jar: less portable, but prettier. Where can you get a nice air-tight box? You can order an entire kit, including air-tight box, from an on-line Nose Work store, like All Good Dogs. Or you can buy just an airtight box. Two popular brands are Outdoor Products and Pelican. Great places to find Outdoor Products boxes are fishing, boating, and camping stores. And of course Amazon. Computer equipment stores stock Pelican boxes, as does Amazon. The popular outdoor sports co-op REI stocks many brands and sizes to choose from. My entire kit: 3 airtight odor boxes, plus tweezers, putty, other supplies. Should you have one combined airtight box, or should you have a separate airtight box for each Nose Work odor? Separate boxes is the easiest way to keep the odors from blending. But it's bulkier to carry around and more expensive. Plastic bags may seem airtight, but odor leaks through them easily. While waiting his turn to do Nose Work, a hungry and impatient (but very charming) Flatcoat Retriever sniffed out hot dogs in a sealed plastic bag, chewed through the bag, and ate most of the hotdogs inside. If the bag won't contain hotdog odors, it won't contain Nose Work oil odors either. Thank you, Grace, for sharing your photo! 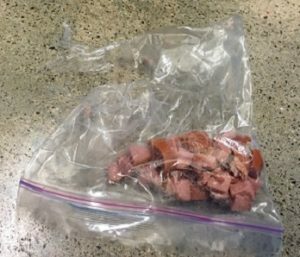 Dogs can smell hot dogs (and Nose Work odors) right through plastic bags like this one, even when sealed. Photo credit Grace Perry. For a tiny travel kit, you can purchase Witz Sports Cases. They look like a pretty awesome and portable way to carry a small kit. Keep an eye on them; some of the reviews claim they can pop open without warning. Plastic take-out containers are made of cheap plastic. They do not contain odor effectively. Don't believe me? Put some freshly fried bacon in a plastic take-out container, and then sit back and watch as your dog confirms this fact. Make sure you store your other Nose Work supplies far from where you store your odor. With our dogs' ultra sensitive noses, they will be able to detect the odor molecules that seep from your odor kit and odor supplies into your other non-scented items. This includes virgin swabs, and containers that will not be holding odor. My Birch kit: Metal tins, plastic toothbrush holders, and shrink tubing. While you set your hides, you never want to put a naked swab out. When you pick up your odor swab and go home, you leave behind a primary source of odor. Nose Work dogs (and this might include your dog) who visit the area will want to source it, but will likely be told to behave on the leash, and will certainly not be rewarded for finding source. So what do you do instead? Put the oiled swabs into tins and other small containers. All Good Dogs is a great place to get tins and other small containers. K9 Nose Work Source stocks regular and colored tins as well as other small containers. For something special, you can even get camo tins! Paws4Fun stocks fun and inventive tubes for holding swabs. You can also get creative, and it doesn't have to cost much. These travel toothbrush holders come with 4 tiny holes on each side; just plug the big hole at the end so the swabs won't fall out. For small hides I love to use heat shrink tubing, which is cheap and comes in all sorts of fun colors. Some people use travel salt and pepper shakers. You can get creative! Anything that will hold swabs securely, while letting out some odor, is a possibility. A note about putting your swabs in plastic "tins": There are many types of plastic. Some plastic will react with the Nose Work oils, which will alter the chemistry and create a whole new odor that's not Birch, Anise, or Clove. It will be easy to tell: the swabs will start to stick to the plastic, and maybe even start to melt the plastic. If this happens, immediately throw away the swabs and the plastic container, and don't use that type of plastic again. When handling your swabs, be sure to use tweezers, hemostats, or gloves. If you use your bare fingers, be sure to wash your hands thoroughly before you spread odor everywhere you touch. We have a whole separate airtight box in which we store our little vials of oil, along with some other raw materials. 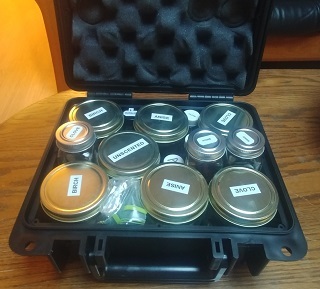 Airtight box containing vials of the oils, droppers, and other raw materials. We suggest that you don't store your vials of odor with the dropper lids on. We've heard of droppers degrading, and the oils spilling out, making a big smelly mess. Even if it's rare, why do it when it's easy enough to put the regular cap back on? Also, notice that we have the droppers separated from the vials. We do that to keep the outside of the vials from getting oil on them. It's easier to keep fingers oil-free, if the outsides of the vials haven't been touched with the oil on the droppers. Notice that the droppers are separated from the vials of odor. Store your odor in a manner that your dog won't be able to detect it when it's not time to search. We store our odor in the kitchen, where our dogs know they never play Nose Work; whether you make the same choice is up to you. Even if you use Best Practices with airtight boxes, it's best to store your odor kits where your dog will not be searching. Astute reader Sandi Pensinger has pointed out that "Flying with essential oils, or traveling over mountains, can lead to leaks as the air pressure changes." If your essential oil will be exposed to a change in altitude, Sandi adds: "bottles with droppers should be capped with hard lids, and put into jars -- or at least ziplock bags." Use 100% cotton swabs with cardboard sticks; no plastic or wooden sticks. In spite of our best efforts, occasionally a dog may swallow a Nose Work oil swab. Cotton swabs with cardboard sticks are the most likely to pass through the dog safely without intervention; that being said, in case of ingestion, it would still be wise to check in with your vet. In any case, break or cut each swab in half. This is way too many swabs for the size of jar. Never, ever, put the oils on something that could be dangerous if swallowed, like a paper clip (yes we've seen that done!). When you prepare swabs, the idea is to spread the oil and odor as evenly as possible to each swab. For best results, take an empty glass jar and drizzle a few drops of odor; then close the jar and swish until the oil coats the glass jar thinly. Drizzle drops of oil around the inside walls of an empty glass jar. Then add swabs, shake shake shake, and store for at least 24 hours (or better yet, several days) before using any of the swabs. How many swabs? The swabs should have enough room to mix it up, so that each swab may have a chance to reaching the oil on the jar. Let's face it, life is busy. So sometimes I take a short cut. If an existing jar of swabs needs to be refreshed, I admit that I'll add new oil while the old swabs are still in it. This is not ideal. The Lazy Method: Add oils to the rim of a jar of swabs that needs to be refreshed. How Often Should I Refresh My Swabs? This is a matter of some debate. It also depends on your climate, how you store your kit, and how often you use your tins. The less air your swabs are exposed to, the longer they'll last. As a rough rule of thumb, I figure the swabs in my tins will last about five weeks, and the swabs stored in large quantities in the jars, about three months. Your mileage may vary. If you can't smell it any more, it's time (probably beyond time) to refresh your odor. How Should I Dispose of Old Swabs? This is a matter of some debate as well. The last thing you want is odor swabs falling out of trash bins in random places. To avoid that, some people flush their old swabs down the toilet. However, several plumbing websites, like this one and this one, advise strongly against ever flushing a cotton swab. What do I do? Mostly, I keep using my old swabs unless they get soiled or contaminated. Every five weeks, I empty the swabs in all of my tins back onto the relevant odor jar, which already has a ready supply of replacement oiled swabs: Birch swabs into the Birch jar, Anise swabs into the Anise jar, etc. I assess whether it's time to add new swabs: perhaps I've given out a lot of swabs to students as starter samples lately, or had to scrap a lot of swabs. If I don't need to add any new swabs, I smell the odor jar full of swabs and decide: do I need to add new oil? Or does it already reek? If I've added new swabs, or if the jar isn't stinky enough, I add new oil to the jar (see above). You can use the same swabs for years, as long as you add new oils as needed. If I do actually need to discard old swabs, I find an old used plastic bag, put the old swabs inside, make sure the plastic bag is securely sealed, and throw the whole thing in the trash. Where Can I Purchase Nose Work Oils and Supplies? Most people who buy their own odor, purchase from Nose Work suppliers, such as K9NWSource and All Good Dogs. That's what I do, too. As an alternative, you may wish to purchase odor directly from an Essentials Oils vendor. The correct oils for NACSW Nose Work are discussed here. It is important that you purchase the exact types of oils used by your scenting organization. Should you buy your own odor? Even if your instructor gives you scented swabs, I recommend that you do buy your own odor vials, and use them to make your own swabs. If you plan to compete, buying your own odor will ensure that you can keep your odor fresh and strong, and that your dog will find odor that doesn't also smell just a little bit like your instructor; plus, you'll be buying odor from different batches, strengthening your dog's drive to find others' birch, anise, and clove odors. So many choices. If you have any questions about preparing and storing Nose Work odors, feel free to contact us or your instructor.